DJ Gleason and Company in BRIGHTON BEACH MEMOIRS. Photo by Bill D’Agostino. 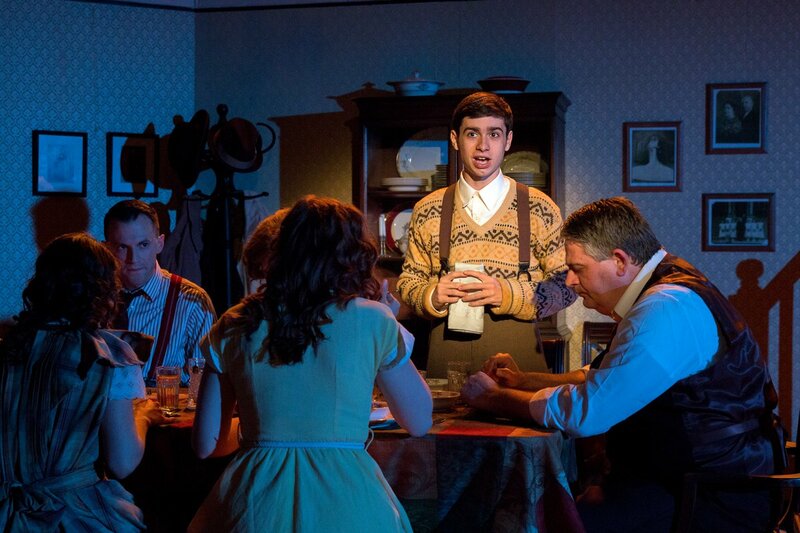 Neil Simon’s Brighton Beach Memoirs is sentimental claptrap, a play for people who need to be told how to feel. Act II Playhouse’s fusty production does little to assuage this; more often than not, it leans into the chintzy aspects of Simon’s sepia-toned script. 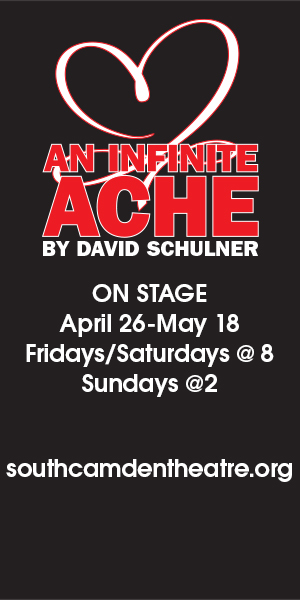 When Simon debuted this play—the first work in his semiautobiographical Eugene Trilogy—in 1983, it was seen as a departure from the boulevard comedies that made him rich and famous in the sixties and seventies. But the foibles of the struggling Jerome family in 1930s Brooklyn does not suggest an understanding of drama, or provide evidence of authorial growth. Every potentially poignant interaction is undercut by a joke; all conflicts are immediately resolved. But why strive for actual introspection when you can disarm your audience with twenty minutes of masturbation jokes, then amp up the schmaltz to trick them into believing they’ve had a genuine moment? 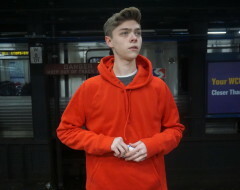 The play further employs the tedious device of direct-address narration throughout, courtesy of fifteen-year-old Eugene (played by DJ Gleason), the author’s stand-in. These monologues—which fall squarely into the “and-then-this-happened” school of narrative writing—do little more than accentuate the paltriness of the book scenes, widening the chasm between what we’re told versus what we’re shown. Matters aren’t helped by the fact that Gleason’s aw shucks approach to Eugene is largely insufferable, but few parts in this production are cast from strength. The role of Kate, Eugene’s loving but headstrong mother, benefits greatly from a naturalistic approach; Laurie Metcalf hit the right notes in the short-lived 2009 Broadway revival. Regrettably here, Mary Elizabeth Scallen has chosen to shout her lines with little vocal variation throughout the evening, making Kate seem closer to the stereotypical harridans found in Philip Roth novels. She also has a distracting habit of striking poses before delivering a line. Julianna Zinkel seems halfway to a decent interpretation of Kate’s fragile sister, Blanche, but her overly pathetic carriage throughout much of the first two-thirds of the play make her assertion of sovereignty in the later scenes seem unbelievable. Katie Stahl wins the worst accent of the night contest as Nora, Blanche’s rebellious and unhappy daughter; she sounds more Boston than Brooklyn, with a fair amount of Little Edie Beale thrown in for good measure. Only Peter Bisgaier, as patriarch Jack, manages a consistently credible performance; we believe the weight of the world is on this good man’s shoulders. The other principals—Jonathan Silver as Stanley, Eugene’s idealistic older brother, and Eileen Cella as Laurie, Blanche’s sickly younger daughter—are barely worth mentioning. William Roudebush’s glacial production seems as if it was directed specifically to allow enough space between lines for the alter-cockers in the audience to repeat the wisecracks to each other and start a second chain of laughter. But the most egregious errors on display are courtesy of Jennifer Povich’s costumes. They range from lazy (Kate only has one dress?) to anachronistic (the ties are pure 1950s) to just plain careless (Eugene’s billowy knickers are distractingly wrong—the play is set in the Depression, after all, when fabric was scarce and costly). James Leitner’s intrusive lighting rarely leaves anything to the imagination. But neither does the text. Powerful and moving theater is supposed to provoke a reaction, not force one. For proof, one need only think of another kind of family story—Long Day’s Journey Into Night, still as devastating now as it was seventy years ago. The scant triumphs and myriad tribulations of the Jeromes hold similar potential, but in Simon’s schlocky hands, we are left with little more than a manipulative roman-a-clef.